I threw out my cardboard stash yesterday. What manner of madness motivated such an atrocity? Ah, as is often the case, we needed the storage space for Other Things. I considered titling this post A Bleak Season or She Would Never Get Out Of Bed Again but you know what? I wasn't as depressed as I thought it'd be. Not even upset, actually. Two reasons: one, the kids have grown up. They are not so old that they're leaving the house to get engineering or culinary degrees, but no longer so young that cardboard toys cause within them rabid levels of excitement. Again, not as disheartening as I'd imagined. 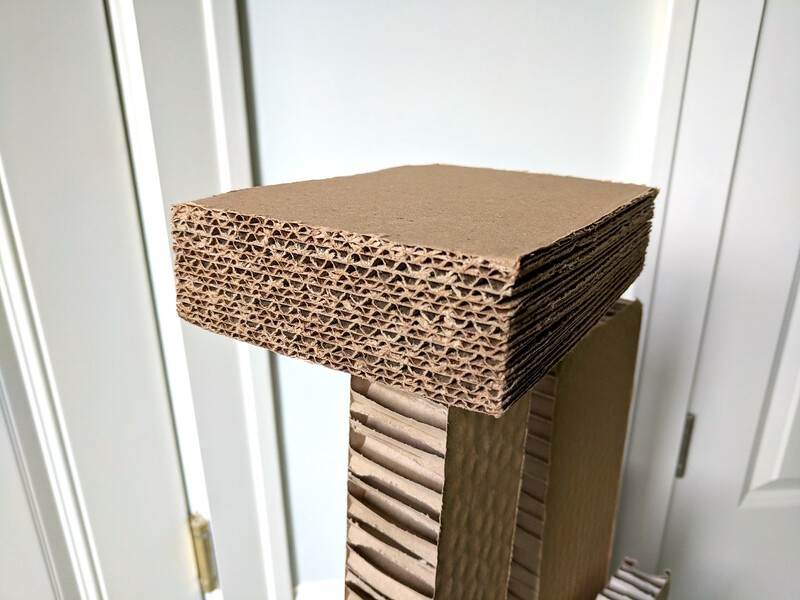 Now, this in no way suggests that cardboard has lost any of its amazingness - no, cardboard will forever be supreme (and no one will convince me otherwise). 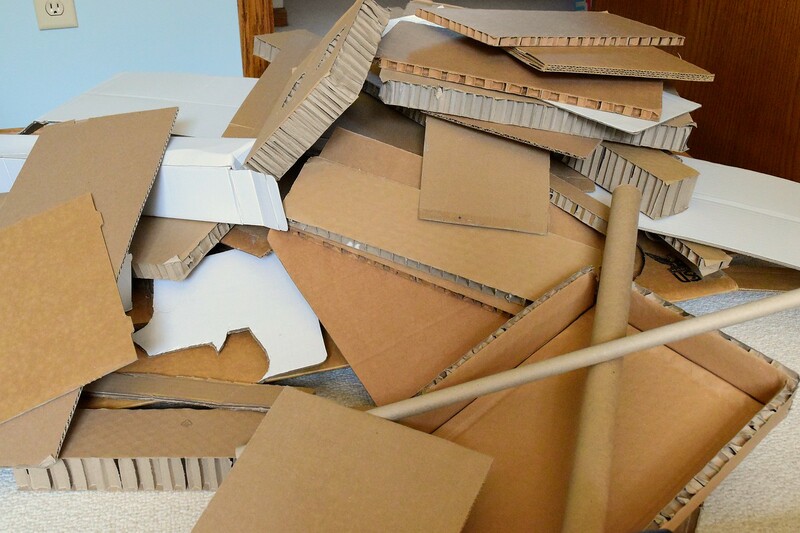 However, I think I'm ready to accept that building cardboard playthings had its moments - of which our family has had arguably more than its fair share - and those moments have somehow passed, and passed with their dignity intact. 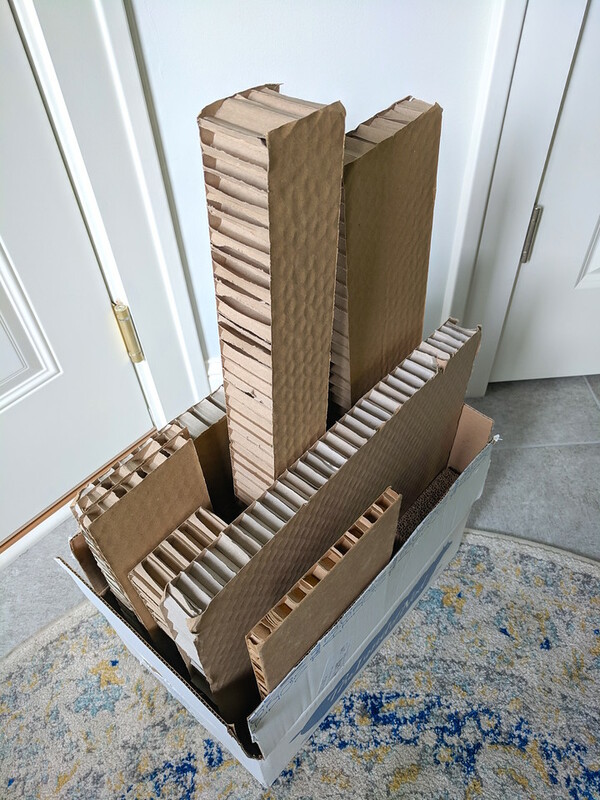 And two, I am comforted by the knowledge that IKEA remains a veritable trove of Good Cardboard - free, large, clean and in an astounding variety of thicknesses, strengths and textures. Should I in the near future require new building material, I can drive there in minutes, find what I need and save the environment, all without sacrificing precious storage space in our house. It was fun to reminisce, though, as Emily and I pulled out piece after piece from under the bed in the guest bedroom, where I had amassed and curated my collection over the years since we've owned this house. "Oh, this was the box from the cardboard nightstand!" "We made the Barbie House from this piece!" "Remember this?" "Remember that?" That's what creating with children is about, after all, isn't it? Not only passing on skills and producing workable designs but also simply being. Sitting and gluing. Slicing and drawing. Decorating and embellishing. All the while making up crazy stories about baby bunnies in hutches, paper fish in aquariums, parrots in pirate ships, castles and maidens and automobiles and telephones and pizza parlors and little peg children journeying to fantastical lands at the tops of impossible trees. But because it's irresponsible (not to mention ridiculous) that a house be completely devoid of cardboard, I let myself keep a few of the more interesting pieces. Do you see that crazy piece in the photo? How many flute layers are there in that piece in the photo? I lost count after ten. They'll live in a very small box in the garage. For emergencies, you know. Well. I just looked at my sidebar and realized that my last post was almost two months ago. I missed you guys! I hope everyone had a lovely summer. Ours was good, but too short. It felt like I blinked and it was the first day of school and I hadn't done nearly enough summering as I'd have liked. The kids spent a lot of time in the water. One of them took a self-taught algebra course that enabled her to skip a Math grade in the fall. Another dabbled very successfully with yeast baking. Two learned to dive off a springboard. At least one of them sewed more than I did, and invited at least one friend over for sewalongs (we made pencil cases like these). I finished a commissioned project for a magazine that took up a fair bit of my summer but which was very rewarding. Everyone hung out with neighbors and friends and got to know each other better over games and food and exercise, before the Big Freeze sends us all back into our caves. Making-wise, I always feel that I accomplished pretty close to zilch with my own projects. Summer is such a non-ideal time for pleasure-sewing; everything else seems to be more urgent, and rightly so: being outdoors, doing things with the kids, tutoring Math, helping dough to rise, riding bikes and swimming under a sunny sky that for just three months in the year, actually feels as warm as it looks. But now fall is upon us. It's nice to have a routine again, and the house to myself now that the kids are back at school. There are upcoming birthdays that require gifts, Halloween activities that require costumes, and ikatbag patterns that require prototypes. Lots of sewing in my future, it looks like. It'll be a good distraction from the cardboard I no longer have. Or, to put it another way: it's a good thing I no longer have cardboard with which to procrastinate on the sewing (sniff). LiEr, it is so good to read this blog update. I know this sounded like a dramatic move to the recycle bin, but I know you saved a lot of the best creations. I know you also have large clear plastic leaf and lawn bags to file those. It seems weird now but later, it is kind of nice. Both of my girls are 30 and 32, married and with little babies, two each. Still too young for cardboard. I have the desks I made for the AG dolls (the older ones that were made in Germany), and a few other special pieces. It is hard to let go of treasures, but we do have cameras now. We have always had two cornish rex kitties in our family and the box fort or what is the satellite office, still exists. I never keep up my old blog, but I do have many photos of that creation. I wish you happy days this last three months of this year!! Life just keeps going forward. That sounds like the best summer. The cardboard was the easy part, cause there's always more. And you have saved very unique pieces. I have the 'things we can make into other things' tubs. I don't make theater costumes for youth groups that need random stuff (goodbye broken headsets and curly phone cord), I just am having the worst time getting rid of the splendid cigar boxes. And the trophy chrome figures (they fit the same thread/tube as lamp parts) ...Lucky for me, I have too much costume fabric and can work that pile down first. Old letters and journals, easy! Family photos, who needs em? I still have those kids ....oh no, wait. They grow up so so so fast. Dear LiEr, Thank you for including so many links to former cardboard and peg doll projects in this post!! I went through them and read the ones starting with "..crazy stories about baby bunnies in hutches, paper fish in aquariums..." BUT the "telephones" links to the castle post!! I was looking forward to seeing what kind of telephones you had made. What wonderful cardboard times you have had with your girls. Thank you for all your work on maintaining this blog for so many years! It's a pleasure to read about your activities and your family relationships. Oh my goodness, this was such a heart-wrenching post to come across at this moment in my life! You don't know me at all but I followed your blog quite diligently for some years, nearly a decade ago. I just loved your whimsy and creativity. Eventually I fell out of the habit of reading, the way we do, and life went on. I have two sons now, ages 1 and 4, and my preschooler has a "recycling project" coming up where we are supposed to make something - anything - out of found recycled material. I instantly remembered your blog and came here for some ideas! Between my job, and the kids, and the holidays (it feels like I just got done patting myself on the back for making Halloween costumes; now I've got to head out of town for a painful extended-family Thanksgiving? decorate for Christmas? make all those gifts? the cooking, the entertaining???) I admit I sort of grumbled about this recycling project. But when I came here and read this entry, all the cardboard finally cleaned out, the "cardboard years" coming to a close - oh, man, it hit me where you really feel it! No, these years aren't easy, but they are magical, in the way that cardboard can be - trash if you don't appreciate it, magic if you do. I have a cardboard stash of my own - I love nothing so much as getting a really big box! and those awesome rigid fluted pieces! - and it drives my husband crazy. I always feel a bit sheepish about the cardboard hoarding, but no more. These days may be long, but these years are short, and if I can fill them all up with cardboard, as you did, then I'll consider them years well-spent!